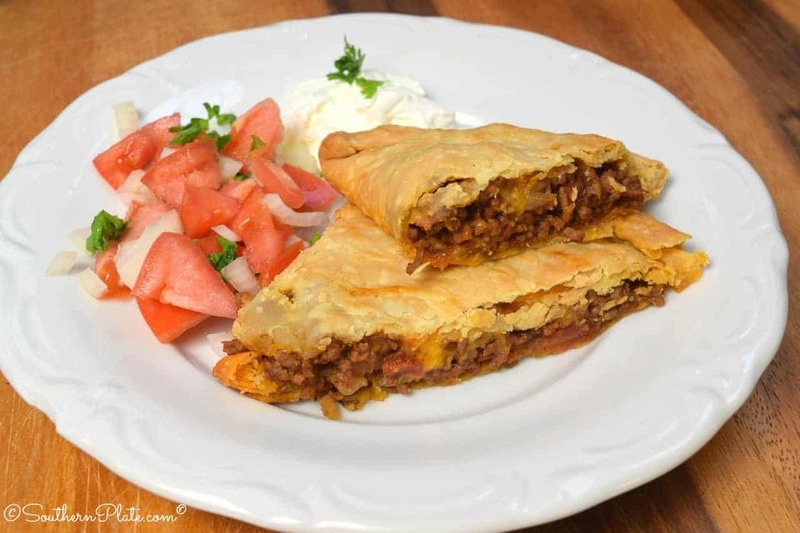 Today I’m sharing a recipe for giant beef empanadas from my friend, Karen Branscum. I’m thrilled to share a recipe from Karen because I have a theory (which has been proven true time and time again, so I’m about to just start calling it a fact) that good people make the best food. Now if my theory/fact is right, that means Karen’s food is PHENOMENAL. 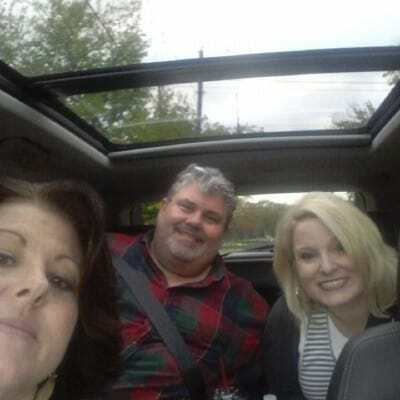 Causing mischief with Karen (left) and Bill Gentry in Dallas last fall. Seriously. She is one of the kindest people you’ll ever meet and I have no idea where she gets the energy to be so kind. She volunteers endless hours for her church, delivers food with meals on wheels, fundraises for meals on wheels (The photo to the right is from last December when she was giving away coupons for free pies in exchange for a donation to meals on wheels at her local grocery store), and she is also a deeply devoted wife and mother who truly cherishes her family. I’m sure I’m not even touching the surface here but let me tell you that anytime I have mentioned wanting to help someone in need to Karen, she is immediately on board as a partner in crime. The only bad thing I can say about her is that she lives too far away. But that is probably for the best. I’d be down for the count in one day if I ever tried to tag along with her. Anyway, I wanted to thank Karen and all of you out there who are just like her. And even the folks who are more like me and help when you can but can’t quite seem to manage the epic-ness that Karen does. God didn’t make us all to be Karens but we are still serving a purpose and helping to lift up our brothers and sisters. I hope you’ve had a good weekend and are planning on having a great week – as opposed to planning on having a bad week, which a surprising number of folks do. “Oh, I have to work all week.” might be the oft heard grumble. Well, does that mean it has to be a bad week? There are opportunities for a good week in a hard week’s work. There are people to interact with, tasks to accomplish, and a life still being lived whether we are clocked in or not. “Well, I’ll have kids all week.” Well good gravy, smile a bit then! Kids can bring a joy to our lives unlike anything else, no matter who the kid is. I won’t get very much sleep this week… I’ve got to pay bills this week…go to court this week…drive a long ways this week…. There will always be plenty of things to bemoan and complain about just as there will always be a group of folks lined up to bemoan and complain about them. Looking on the bright side. Seeking the joy, now THAT is where a life of the supposedly mundane becomes a life worth living. I will smile today. I will notice the sun. I will pause a moment, close my eyes, and lift my face until I feel it’s warmth on my cheeks. I will squeeze you for all your worth when you come in for a hug rather than the usual “pat and go”. I will drink my coffee for pleasure, not just for caffeine. I will look you in the eye when you speak to me and see you as a person with a spirit seeking and hoping just like mine. I will take this day that has been given to me and recognize it for the gift it is. It’s hard to see the silver lining when we spend all of our time pointing out the clouds so I will adjust my focus until the silver nearly blinds me with it’s glory. Our lives are worthy of no less. 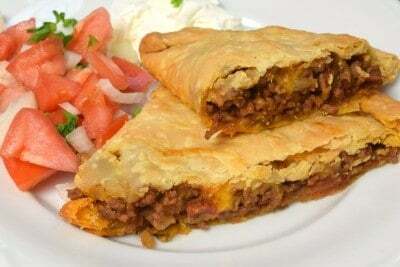 Now here is Karen’s recipe for delicious Beef Empanadas. Karen is from Texas so she knows her stuff here. A flavorful and savory filling inside a tenderly flaky crust. What’s even better is that this recipe is an easy one and y’all know those are my favorites. Life is complicated enough without bringing all that mess into our kitchens! 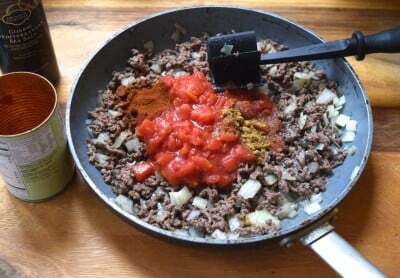 You’ll need: Pie Crusts (You can make your own or use store brand roll out crusts), Cheddar Cheese, Salt, Diced Tomatoes, Pepper, Onion, Chili Powder, Cumin, and Ground Beef. 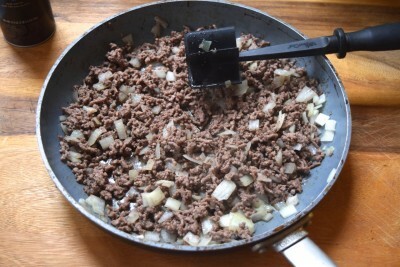 Brown your beef and onion in a large skillet over medium high heat, breaking it up really well as you do. Add your tomatoes and seasonings and stir together. Return to heat. Simmer uncovered stirring occasionally for 20-25 minutes until mixture thickens and most of tomato juice is absorbed. Karen says it is important to place your pie crusts exactly where you want them because once you put the filling in there will be no moving without tearing. So I hung each over a bit on a large cookie sheet. That way I can just flip the top over and be done. Place one unrolled pie crust at one end of greased cookie sheet. 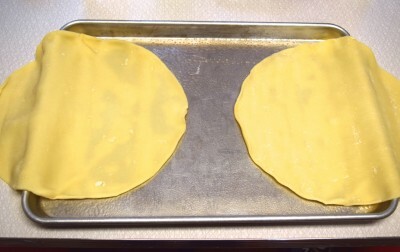 (If baking both giant empanadas on same cookie sheet think ahead about placement. Once beef is added you cannot move empanada). 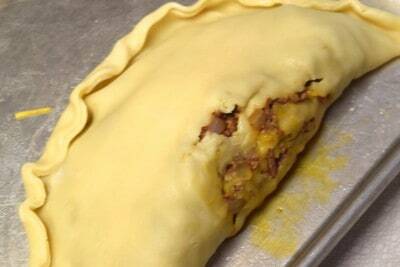 Place half of beef mixture on half of pastry leaving one inch border around edges. 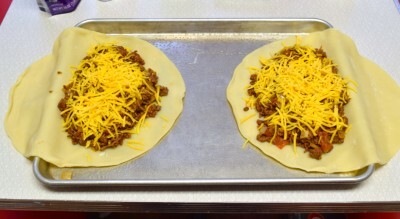 Sprinkle with about ½ of cheese (careful not to over fill with either beef or cheese) Carefully pull remaining dough over, covering meat and cheese meeting the edge of bottom crusts.Spoon your filling into each one. Karen says not to overstuff your pie crust or you’ll have a blow out. These photographs are excellent examples of me overstuffing. I did have a blow out. Don’t overstuff. You need about 2/3 the amount of filling shown here. If you do have a blow out you can patch it with more pie dough or cook it as is, it will be fine and still taste wonderful. It drives me crazy when folks tell me something didn’t turn out perfectly and they threw it away. Seriously. I actually gasp in horror whenever I read one of those comments. Threw it away? Even my goofs get eaten. To this day I have never had a meal so bad that we couldn’t manage to eat it and call it supper. Every now and then someone will say something along the lines of “The stew was too salty, we had to throw it all away…” and as my eyes bug out of my head I stare at my computer screen and silently scream “ADD MORE LIQUID TO THE STEW! TOSS IN A POTATO TO ABSORB THE SALT! It is a different mindset from a generation too far removed from hunger, I know. But it takes a few beats away from my heart even now, just thinking about it. Lord help us all if the day comes again when folks can’t waltz into a grocery store and fill our baskets with whatever our persnickety pallets desire. I’ll be happily live off weeds, critters, and things I grow and raise in my back yard and “digging up a little supper” as my great grandmother used to call it. Okay so you fold your beautiful pies over and then fold the edges up and press them to seal a bit. You can use a fork or just your fingers. Then, beat an egg and brush that over it, too. Wanna see my blow out? I patched it up with a little dough and smoothed it over a bit. A little meat and such popped out when I was cooking it but you know what? It still ate just fine! No one felt the least bit horrified at the supper table when they saw it. They smiled and said it looked good and ate it up. And if anyone had of thrown it away or acted horrified at my house…. well lets just say they know better because they were raised to know better :). Bake these at 400 for 20-30 minutes, or until golden brown. 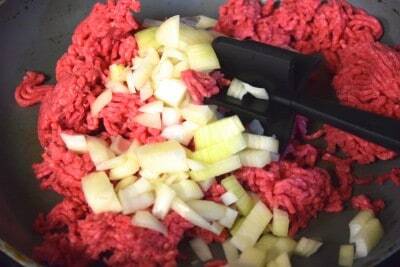 Cook beef, onions & green pepper in skillet until meat is no longer pink; drain. 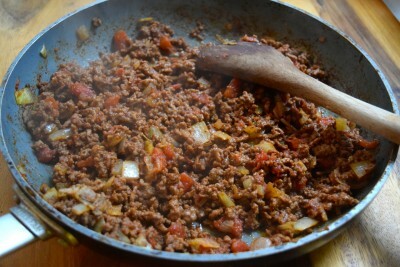 Return beef mixture to skillet and stir in tomatoes, chili powder, cumin, salt, & pepper. Carefully pull remaining dough over, covering meat and cheese meeting the edge of bottom crusts. Crimp edges with fork to seal all around. Brush top with yolk mixture. 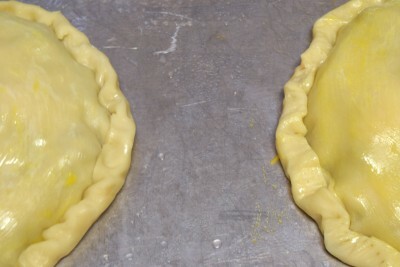 (You should have a half moon shape) Repeat above with remaining pastry. Bake at 400 for 20 – 30 minutes or until golden brown. Serve with shredded lettuce, chopped tomatoes, sour cream and guacamole. Notes from Karen: I rub a little water with my fingers around border of pastry. This will help the dough seal together, then crimp with fork. I caution about planning ahead on the positioning of dough on pan…you can’t move it once filled! Also don’t overfill or pastry will break. Pull dough slowly to try and slightly stretch it as you go over. To help with this you can roll dough a little bigger with rolling pin prior to placement. The Ultimate Football Recipe Collection! Oh Christy, I near have a heart attack if I hear somebody say they threw food out. I tell them “eat it, it ain’t gonna kill ya”. Not like I confused the salt with Decon. LOL!! LOVE IT and love you!!! Hey I am new to this blog! I love it! So far I have only made the stuffed pepper soup. I was wondering if you thought these empanadas would turn out ok as indiviual ones using cresent dough folded over ?! I made the Empanadas last week. They turned out good and my wife and I enjoyed them. But to me even eating them with lettuce, tomato, a little hot sauce and sour cream, they seemed to taste dry. Maybe I cooked the meat mixture too long? Maybe I didnt add enough meat mixture to each one? Any suggestions? Eat them with some salsa. Wet ingredients do not make flaky crust, just soggy. Dry is a good thing in this case. Do you know if I could use rotels instead of diced tomatoes and would these freeze well? These look awesome! If I have any ground beef in the freezer (and I better! ), this recipe will be tomorrow night’s dinner! Oh I’m excited! let me know what you think! They are so good! They were delicious! My son loved it and I will definitely make them again. Very easy and quick! I am so glad you liked them Susan!! They are always a hit here too!! I’ve never had leftover pie crust, but I like your idea! Those are so cute. I’m tinkhing something with Nutella if I did have any leftover. I have never made crust from scratch, though! Looks great, although the term “blow out” reminds me of memorable diaper changes! Just curious, have you ever shared how you keep your pans so shiny clean without using parchment? I would love your secret formula! I’ve tried every magic potion on Pinterest and my cookie sheets are still dark and grungy-looking. Oh oh oh! Lesley I’m glad you asked that (and I am very familiar with that type of blow out as well!)lol. It’s all in the pans themselves. I never do anything special to them. In fact, half the time I wash them in the dishwasher and half the time I wash them in the sink but have never had to scrub them or use anything special to them. I get them from Sam’s club in the restaurant supply section and my mother and I both LOVE THEM. I think I pay around $15 for two and I have some I’ve had for close to ten years that look just as new as when I bought them. I even take them with me when I travel to do TV and have sent some home with food stylists who fell in love with them as well. I hope you can get some soon! If you don’t have a Sam’s club, look for restaurant grade baking sheets and they should be pretty cheap (ten or less each). I can’t wait for you to get some now! I too love, love, love those pans. I paid about the same and have had mine for 9 years, I use them for everything. If I’m baking something in a flimsy tin pan I use them to set the pan on. I really like the Sam’s pans as well. Mine are still going strong and have been used numerous times and are still shiny. Like you, mine are cleaned either in the dishwasher or sink and are great all-purpose pans. I to use the Sam’s pans…they are a gift to every bride or first apartment person I know. Smart & Final also carries them. I’ve had mine about a year, and they still look new, and I’ve never touched them with S.O.S.-just soap, water and a scrubby sponge. They are very reasonably priced there, too, around $15.00 if I remember rightly. I do like my Dishpan Cookies better on my old, darkened cookie sheets, though, but that’s the only thing. I got racks for them at Amazon and nothing could be better. These look delicious, can’t wait to try! Thank you Peg!! Let me know how you like them! Hey Christie, I made the Empanadas tonight. I had a big problem with the dough. It was dry & broke apart. We had a store brand pie dough. Will try Pillsbury next time. But it was very good & I will try again. I was thinking about putting the meat mixture on top of Tostito chips along with the cheese, tomatoes, lettuce & sour cream next time. I did make refried beans & it all was delicious, even though it looked a wreck. Lol! Thanks for the recipe. Oh & thanks for the index of recipes, so much easier!! Sorry about you initial results…I would first make sure your dough was in date. Another thing could be if the dough was to warm when you put mixture in it. Or the mixture was to hot. Let it cool to warm. I take pie crust out of box. With it still rolled in wrapper I leave it at room temp about 5 to 10 minutes. You can gently roll it with rolling pin just a little to stretch it or place on pan and pull gently just to make it a little more pliable for the fold over. Fill with cooled meat mixture..careful don’t over fill. My daughter made it & had troubles & said she took her dough out of freezer & she thinks hers breaking a part was because the pie dough was partially frozen when she filled it. Hope this helps…btw I use the Pillsbury but I don’t think it matters. Also your use of the meat mixture on top of Tostitos is a great idea. 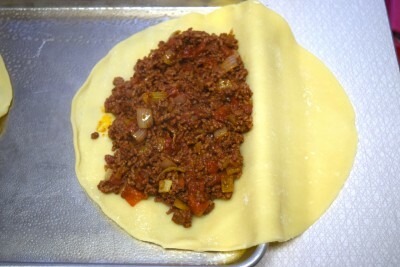 It’s only my hubby & I at home so I will make one empanada & freeze remaining meat for later. Woohoo I’m internet famous again! Lol. Karen is the awesomest! I bet those empanadas are fantastic! Miss you both tremendously. Wish we all didn’t live so far away from each other. Thanks for making my day, dear sister. Great post! Hi Christy. I wrote to you a couple of years ago, or whenever it was that you updated this website before. At that time I pointed out that I could not find an index to look through like you previously had. You fixed that. Thanks! But since this last update (which I like very much), I have not had need to look through the index for something until today. It seems I am having the same problem as I did after the previous update. Is there a way to look for something that I don’t know the exact name of without having to go through pages and pages to find it? Maybe I am just missing where there is an index list by category but with no photos. Thanks for any help. Love your recipes! You know, most suggestions that folks make about the site are good suggestions, but would cost thousands and thousands of dollars to implement. I was relieved today that you suggested one that took me five minutes and was doable by myself 🙂 If you look up in the very top right of the page, above the book, you will see a link to the written index of all categories now (no pictures). Thanks for letting me know this would be helpful and I hope it proves to be so! Everyone should give these a try. Our grandsons love them. We have made them to have during football games. They are perfect since we can hold them and enjoy them during the games. I’m su r email your family will enjoy them as much as ours does. Thank you so much Karen for sharing this recipe with us! Well Christy, I looked at the faq and found a link there for the index. I should have looked there first. However, it would be helpful to have a link on the main page like I think you did before. Well, anyway, maybe my writing this helped someone else to find it! Shelley, thanks for pointing out that the link for the Index is in the FAQ’s section. I know I’ve read the FAQ’s before, but I had forgotten the Index link was there. Like you, I use the search feature to find recipes but once or twice I was unable to find a particular recipe that way. I agree with you that having the Index linked on the home page would be very helpful! I am so excited to try this!! I have loved your site ever since I found it. And the fact that you live in Alabama is awesome!! I have had some pie crusts in the freezer since Christmas, I bought them from Sam’s Club out of desperation because I didn’t plan well. Every day I move them around, getting to the real food to cook, and wonder and wonder what am I going to do with all these pie crusts. And then to my wonderment! Look what arrived!! Sweet words for my sweet sister-in-law! So glad that others are getting to know just how wonderful she is, and that we are all so blessed to know her! Well right back at ya sister in law Christine! It was so much fun to share & feel like a celebrity chef for a day! Or 2 or 3 🙂 thanks Christy for this wonderful experience it was a blessing to me. I want to that the southern plate family as well…you are so kind & by the variations you posted & ideas given you to are a blessing. Thank you! Lesley, after I’ve cooked anything in an aluminum pan I wash with hot soapy water and if there is discoloration or anything still stuck on it I use an SOS soap pad and scrub away! (Depending on what it is, it may take a little elbow grease) but mine always comes out great and the pan really shines. And by the way, finally got around to making your Mama’s scalloped potatoes last weekend. They were so good!! YUM!!!!!!!!!! These will be making our dinner menu VERY soon! Hi Christy,wow i am cooking these babies right now, so good,quick and easy!! Thanks once again Christy. Have a blessed day! 🙁 This is my sad face because, darn it, I just used up my last pie crust last week! I made quiche just to get rid of a pie crust that I had in the fridge, leftover from the holidays. If I still had it I’d be making this for dinner tonight! The recipe looks great and I’ll definitely be trying it real soon (pie crusts are going on the shopping list now). Thanks to Karen for sharing her recipe, and thanks Christy for the post and pics! I’ll post again after I make it some time next week. My late husband loved these…but they were the frozen kind. I can’t wait to prepare this, and send this recipe to our kids. They are grown now, and I’m a proud grandma…..but you know how a meal can bring back some wonderful memories? Oh, Christy! This looks INCREDIBLY good….but I have to think ahead about the problem of my husband being a diabetic. Do you foresee a problem with substituting 10″ whole grain flour tortillas secured with toothpicks in place of the pie crusts, or should I just ‘fly by the seat of my pants, use them anyway and report how they turned out? 😉 LOL Exactly what does the egg yolk mixture do to the outside of the pie crusts? I’ve seen recipes call for brushing with an egg white and water solution, but never yolks. Oh, great and knowledgeable Home Chef, what be your opinions? Linda, why not make your own whole wheat crust. I made these this evening and they were amazing. I didn’t have any pie crust so I made my own as if making a pie. It worked great and was very flaky. Oh, Christy! This looks INCREDIBLY good….but I have to think ahead about the problem of my husband being a diabetic. Do you foresee a problem with substituting 10″ whole grain flour tortillas secured with toothpicks in place of the pie crusts, or should I just ‘fly by the seat of my pants, use them anyway and report how they turned out? 😉 LOL Exactly what does the egg yolk mixture do to the outside of the pie crusts? I’ve seen recipes call for brushing with an egg white and water solution, but never yolks. Oh, great and knowledgeable Wizard Home Chef, what be your opinions on my queries? I had a friend who made pie crust for her diabetic husband, she said it was the fat and flour that was the problem, which is the entire pie crust, she just made them, and rolled them thinner than most people do. I roll my tenderflake lard pie crusts almost thin enough to see through. Never have a problem with them, the most problems I have as a diabetic, is the fact that I have no will to stop with one pie slice, or tart, I eat too many. These look way too good to pass up! As for the egg wash it helps to brown the crust so you get that delicious deep colour and crispy crust, I will wash mine with whipping cream if I have it, and egg beaten with a bit of water, I use a whole egg, but you can use either the whites or the yolk beaten with water it does the same thing. Makes the crust shinny too! If its a berry pie or or whatever I have dusted it with sugar to give it a bit of glitter it helps the sugar stick. This should be good, since its quite high in protein, (especially if you over stuff them) I would serve them with a lovely green salad with a vinaigrette dressing and call it a meal, if you served them with beans it would be even higher in protein and would balance out the crust even more. Thank you both for your suggestions, Marsha & Eva! My comment got posted twice by accident. Didn’t do it on purpose though. I think I heard the Internet hiccup, then a screen came up saying “I had said that before” but I hadn’t presssed the submit button yet. SO, in my complete flabber-gasted-ness I went back to look for my incomplete post and behold…there it was!!! Did a quick proof read, added a word or two, pressed the button and it appeared! YAY! Marsha, sinceI stink at making pie crust I’ll have to pass on trying my hand at it again. It comes out looking like a train wreck and just as tough. Thank you very much for responding though! Eva, your idea might just work! I have a handy-dandy rolling pin to do it with. I may try both ways of doing the outside crust and report my success or failure. Since I have the 10″ flour tortillas and box of toothpicks already I may try that way first. Will put the tenderflake lard pie crusts on the grocery list. Thank you very much for responding, Eva! I liked the side dishes you mentioned. 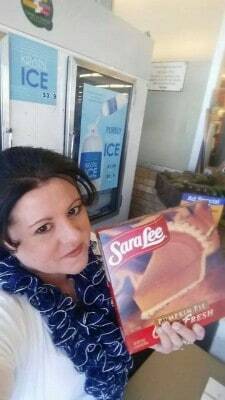 Linda I saw a box of gluten free pie crust mix at Wally World (Wal-Mart) I go not know if it is any good or not as I’ve not tried it yet. I have an elderly neighbor that can’t have gluten so I will try it. As for making a pie crust Christy has a no fail recipe on her site. Opps…. do not know I don’t know where the word go came from! I guess I am wanting to go somewhere. Oh elaineraye I can relate – I go so far as to not let apple cores,banana peels, potato or carrot peels go to waste, onion ‘outtings’ , coffee grinds, tea leaves, egg shells… the list goes on. It either goes into my compost pile OR in a pot for stock THEN into my compost pile. My Culinary students chide me I am sure. But most have never had to work too hard for their food, so I try to bring them down a few notches about The Real World. ( I even have my fellow teachers bringing me their ‘scraps’ from home and lunch!!! ) I can not wait to see what kind of nutrients these will put back into my garden this summer. We always made a creamed ham pie, like this, they were great for school lunches, and easy enough to make. Mom would get a can of ham (1 pound size) and dice it in chunks, (about half inch) and then make white sauce, and add a can of drained mixed veg, and the ham, and let it all cool a bit so its not runny. cut out circles (she used a hood for a spot light that I had found, its about 5 inches across and makes nice sized circles for the muffin tins or hand pies as she called these pies) then she’d bake them in the oven and soo good. We’d get at least a doz pies from the tenderflake recipe which is supposed to make 3 two crust pies. I never did them with anything else in them, but you could put almost any filling into a hand pie and it would be yummy. I like the way you think Elaine!! Some of your “waste not, want not” tips are fabulous and ones I had not thought of!! Thank you for sharing! I’ve printed this recipe out and will try it very soon, looks delicious! I hope you enjoy them Shelli!!! I have one of these tools and it is a Pampered Chef Mix n Chop. I is good for many mixing job but excels at chopping hamburger and sausage. I think Christy did a full recipe and blog on this some time ago.. Thanks for the question and the answer. I also wondered what it was. Love this web site. Love the recipes. The comments are always wonderful and helpful. I just have to read all of them. Hi Tracy, I find that a thin wood spoon works fairly well in separating ground meats if you don’t have one of these tools. A potato masher works great. Not the kind with a grid full of holes but the one with the little back and forth metal lines. I have been cooking meat pies like this for years. Try a can of Rotel instead of diced tomatoes. Spicier but good. The ingredients are now on my shopping list and I just can’t wait to try these! We recently had an empanada chain open up in our neighborhood. Theirs are about the size of the palm of your hand and rather pricey. It’d cost half a paycheck to take care of my hubby’s appetite in there. Hey Christy! Love you, love your blog, love your recipes, love your attitude!!! You are delightful! This recipe looks great and I can’t wait to try it. Just wondering how many you think it would serve. I have 3 teenage boys who I know would love this, but they eat a lot! Also, I just found out something that everyone else may know but I didn’t. 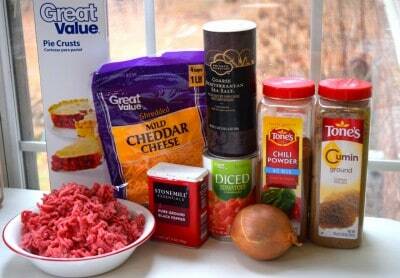 We have a grocery store here in middle Tennessee called Fresh Market, and they sell ground chuck for $2.99 a lb. every Tuesday. It’s a great deal for all your wonderful ground beef recipes. Have a great week, and thanks for sharing!! As with most every recipe it really depends on how much each person eats. With 3 teenagers, I would probably double it. I have found that teenage boys tend to eat a LOT!! Thanks you for sharing your ground beef tip, I am going to have to check into that!! My husbands aunt once made stew so salty the dogs wouldn’t eat it, we had to throw it out, it got that way because she couldn’t taste the salt and kept adding salt to it, I am not sure why all of a sudden she couldn’t taste it, but my older cousin had a head injury and he lost his sense of taste, he said the only good thing from the whole accident was that he could now drink rum, for some odd reason he never could stand the taste before, and since he couldn’t taste now, he could indulge in a drink of rum now and then! AS IF it was any good to drink it without tasting it?? I do not understand the concept! This made me LOL!! I am not understanding what the point is either Eva, but since I don’t drink I am not sure I will ever understand that but it did make me laugh!! Made these for dinner tonight. Family loved them. So good. Thank you for sharing your Mother’s Scalloped Potatoes Recipe and Karen’s Empanadas Recipe. I am going to attempt to make both of them! I hope you enjoy them both Martha! !